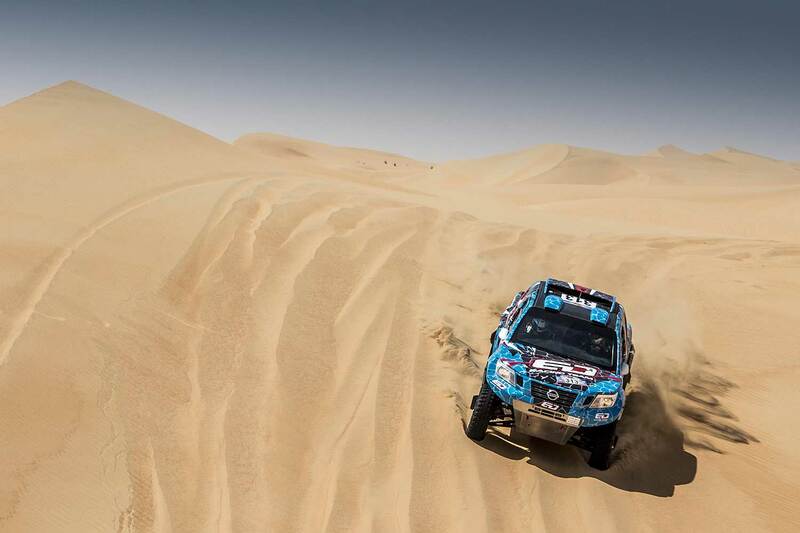 ED Racing’s Essa Al-Dossari and navigator Ali Hassan Obaid from Saudi Arabia negotiated the first of the treacherous sand dunes on the opening 276.01 km selective section of the Abu Dhabi Desert Challenge in a time of 03:55:47 and finished 14th as best of the all-new Red-Lined / Sabertooth Nissan Navara built in South Africa, +43:51 minutes behind the stagewinner Jakub Przygonski from Poland (X-raid Mini). "Saturday we finished the super special stage in 11th position and we were 14th on the stage on Sunday," said Al-Dossari, who rolled his car in the Dubai International Baja two weeks before and had to retire there. "We have adopted a specific plan for this rally. We have decided not to take risks through fast driving to keep the car intact and to progress gradually over the coming stages. There is still a lot of racing over the next four days." 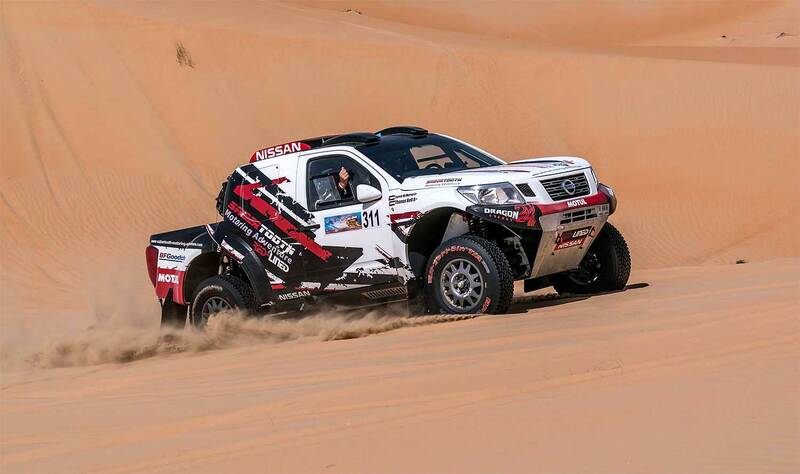 The second best Red Lined Nissan is piloted by constructor Terence Marsh from South Africa himself together with navigator Riaan Greyling - they could finish Sunday´s SS01 as 15th in 04:02:28 hours, +50:32 mins behind the winner. "We now have another four tough dune stages ahead of us," said Marsh after the stage. "The dunes here are a lot more complicated with varying types and shades of sand which are somewhat different to the dunes which I have previously experienced in the Namibian and Gobi deserts. We came here to take ourselves out of our comfort zones and that we have definitely done....the adventure continues!" The third South African built Navara under the flags of Sabertooth Racing of Thomas Bell / Patrick McMurren finished 16th (04:14:49, +01:02:53), the fourth Red Lined Navara of Shameer Variawa and Zaheer Bodhanya 27th (04:58:30, +01:46:34). 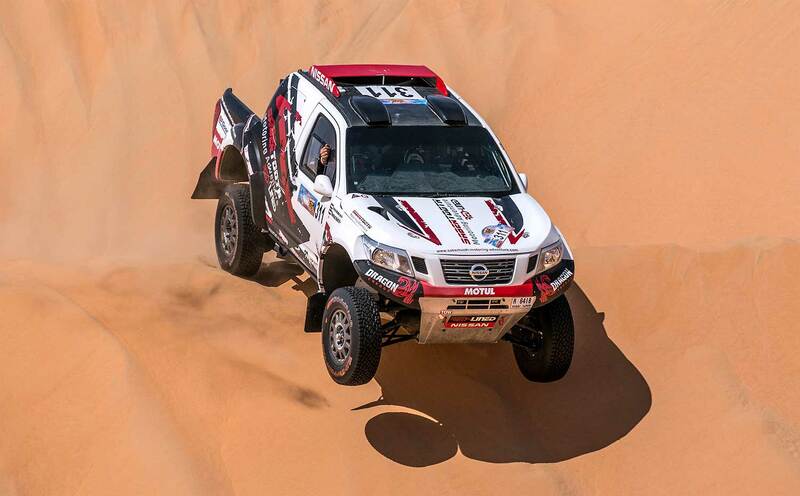 Best car of the Nissan brand in the first stage was the private Nissan "Trophy Truck" of the locals Khalid Al Jafla / Ahmad Malik as 10th (03:34:08, +22:12), second-best Nissan the private Nissan Patrol Pickup of Yahya Al Helei / Khalid Al Kendi on 12th position (03:40:11, +28:15).